Crystal Healing Course are available for Basic Crystal Healing or Intermediate Crystal Healing. We are also running Basic Crystal Courses for children who are interested in working with their crystals. As our lives become more hectic and more involved in technology we tend to lose sight of the reasons that we are here in the first place. Crystals have become very popular in helping us to remember our purpose and have become a very popular form of healing. In society today stress has become the main reason for imbalance in our lives. Stress can come from work, family, relationships, money, loss, grief, personal expectations and social expectation. There are now so many stress related problems and diseases that overall the health of society as whole is declining rapidly. Early signs of imbalance are insomnia, tension, headaches, mood swings, emotional or mental instability. If not dealt with these can become advance health issues such as heart disease, ulcers, cancers, respiratory disorders and so on. Crystal healing can help to realign our mind, body and spirit for health and well-being. They can help us to reduce stress and tension, reignite our passions and creativity, improve our memory as well as helping us to heal ourselves and remain grounded. Crystal healings have been used for centuries in many different cultures for their healing energy and protective powers. Each gemstone and crystal vibrates on their own individual frequency. They vibrate in a way that resonates with and strengthens particular energies inside each of us. Modern technology uses crystals in many products including computers, radios, communication systems and even medical equipment. 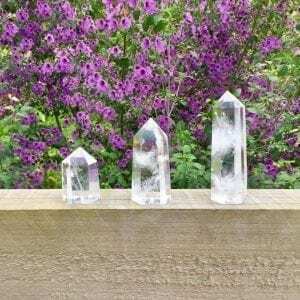 Our crystal healing courses will teach you about the values and healing properties of the most popular crystals as well as some of the not so well known ones.